Interventional radiology is the medical practice involving minimally invasive procedures in the diagnosis and treatment of various medical conditions as against complex and open surgical process. Interventional radiology procedures are performed with the aid of image guidance systems and includes various processes such as biopsies, cancerous/non-cancerous tumor removal and intravascular procedures. Globally decreasing popularity of the open surgical process is expected to be the key driving factor for interventional radiology during the period of study. This report identifies the interventional radiology market size in for the year 2014-2016, and forecast of the same for year 2021. 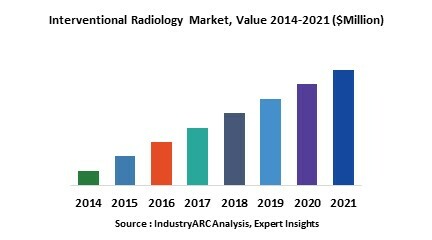 It also highlights the potential growth opportunities in the coming years, while also reviewing the market drivers, restraints, growth indicators, challenges, market dynamics, competitive landscape, and other key aspects with respect to interventional radiology market. Globally North America dominated the market for interventional radiology in 2015 with highest market share due to developed medical and healthcare establishment with latest healthcare equipment and best surgical practices in the world. North America was followed by Europe and Asia-Pacific as the second and third largest regional market respectively, for interventional radiology. However, Asia-Pacific is expected to be fastest growing regional segment during the period of study due to fast growing healthcare setup in the region especially in India and China along with growing awareness about the interventional radiology in the region. This report on global interventional radiology segments global interventional radiology market on the basis of imaging modalities, application, procedures and market size in various geographical regions. This is report has been further segmented into major regions, which includes detailed analysis of each region such as North America, Europe, Asia-Pacific (APAC) and Rest of the World (RoW) covering all the major country level markets for interventional radiology in each of the region.